Today I'd like to introduce to you Dr. Kei Takeyachi, owner of Tokyo Chiropractic and executive director of the Japanese Association of Chiropractors. In this interview, Dr. Takeyachi has graciously shared quite a bit of information regarding chiropractic care in Japan. So if you're seeking a chiropractor here in Japan and not sure what exactly to look for, or you used a chiropractor in your home country and you want to learn more about how what chiropractic is like in Japan, read on! Ashley: First of all, please tell us a little about yourself, your clinic and what you do. Dr. Takeyachi: I’m a third-generation chiropractor, graduated from RMIT University School of Chiropractic, Australia in 2002. I grew up in an environment where my grandfather, two uncles and father were all chiropractors so it wasn’t strange to follow in their footsteps and become a chiropractor. As of today two of my cousins, who are medical doctors, are also chiropractors. In 2003, after I came back from Australia, I worked in Shimbashi Chiropractic Outpatient Center, a teaching clinic of Tokyo College of Chiropractic (formerly RMIT University Chiropractic Unit-Japan), for eight years. 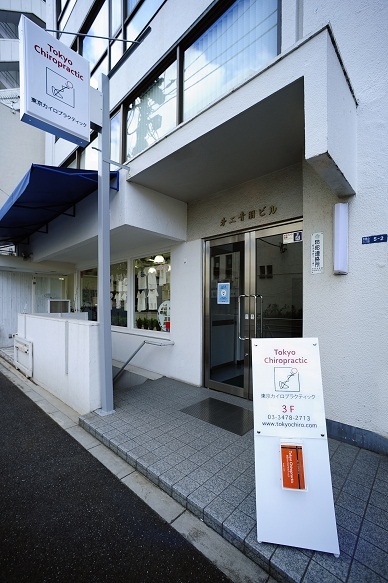 Last October I opened up my own chiropractic clinic,“Tokyo Chiropractic,” in Aoyama as the successor to my family’s chiropractic clinic that had been established in 1949. I serve as executive director of the Japanese Association of Chiropractors (JAC), which is a national member of the World Federation of Chiropractic (WFC) affiliated with the World Health Organization (WHO) as NGO. JAC’s main role is to establish chiropractic regulation in Japan based on the WHO standard so that people can receive high quality, effective chiropractic care safely. I’m involved in several organizations such as Integrated Medicine Japan (IMJ), Asia Pacific Chiropractic Doctors Federation (APCDF), and the International Board of Chiropractic Examiners (IBCE). I travel overseas at least a couple of times a year to attend meetings and exchange professional information between Japan and other countries. Ashley: Would you explain to us more about chiropractic care, what it involves, and what issues people commonly see you about? Dr. Takeyachi: Chiropractic is a natural, conservative, medication-free and non surgical form of health care that focuses on the relationship between the body’s structure, mainly the spine, and how it functions through the nervous system. Although chiropractors (practitioners) may use a variety of treatment approaches, they primarily perform spinal manipulations (adjustments) to correct misalignment of the spine. This is to improve function and support the body’s natural ability to heal itself. Chiropractic is practiced in over 90 countries throughout the world and is regulated as an independent profession in each national health care system. The primary health care practitioners have the title of “Doctor of Chiropractic (DC)” in about 40 countries including the US, Canada, Australia, New Zealand, UK, etc. WHO has now published guidelines on basic training and safety in chiropractic to regulate chiropractic services within these health care systems around the world. Chiropractic treatments typically focus on back pain, neck pain, headache and joint pain but may focus on other areas as well. Some people use chiropractic care for the prevention of musculoskeletal disorders (which includes muscle and joint problems relating to the spine and extremities due to physical inactivity, injuries, bad posture, joint disease and so on.) and health maintenance. The most common reason patients seek chiropractic care is for back pain and disability. There have been many studies that show the safety and cost-effectiveness of chiropractic care for back pain. Ashley: Regarding chiropractic care in Japan, is it very different from chiropractic care in other countries? Dr. Takeyachi: To a certain extent, Japan is different from legislated countries in that there is no chiropractic regulation here. However, from a patient’s point of view, you wouldn’t notice much difference in the types of treatment because chiropractors work with the patients directly to provide care. In Japan, western medicine holds a monopoly in the health care system, so chiropractic is categorized as a non-licensed, quasi-medical practice. This means chiropractors don’t have a license nor can they take X-rays or make an official diagnosis. According to the telephone directory, over 20,000 chiropractic practitioners exist in Japan. Most of them are substandard chiropractors who learned chiropractic from a weekend or two-year, part-time course. Only about 800 chiropractors meet the WHO educational standard. In order to meet the WHO standards, a chiropractor must fulfill a minimum of a four-year, 4,200 hour, chiropractic-specialized education with subjects including anatomy, physiology, pathology, radiology, diagnosis, chiropractic technique and so on. Amongst these 800 chiropractors who meet WHO standards, most are graduates of Tokyo College of Chiropractic (formerly RMIT University Chiropractic Unit-Japan) and overseas colleges. Ashley: If someone would like to see a chiropractor in Japan, do they need a referral? Dr. Takeyachi: No, chiropractors have the right of primary contact with patients. If you see a chiropractor who meets WHO standards here, they have extensive training in diagnosis to determine your condition and to decide the best treatment/management. Again, though, they aren't allowed to make an official, direct diagnosis. For example, they could say you have a "misaligned disc" instead of "disc herniation", or "wear and tear of the joints" instead of "degenerative joint disease." This is an ambiguous, gray area. For example, in the US, chiropractors (Doctors of Chiropractic) are primary health care providers for most insurance companies, so you don’t need a referral before visiting your chiropractor unless your insurance plan requires a referral from a medical doctor. This also applies to work injuries and automobile accident injuries. Ashley: Do chiropractors in Japan offer combined chiropractic/massage services at their offices? Dr. Takeyachi: Shiatsu/massage therapy is a licensed quasi-medical practice in Japan. Massage services are only allowed by practitioners who hold a shiatsu/massage therapist license or medical doctor (MD) license. Therefore, chiropractors don’t use the massage technique. Some chiropractors may apply manipulation or mobilization techniques on soft tissue. Many chiropractors in the US and Australia hire massage therapists to provide massage service to patients before performing spinal manipulation. Ashley: How much do chiropractic services in Japan typically cost, and how much of this cost is covered by the national health insurance? Dr. Takeyachi: Average chiropractic fees in Japan can range from 3,000 to 6,000 yen per session. At the initial visit most chiropractors charge an additional examination fee of between 1,000 and 5,000 yen. The national health insurance doesn’t cover the cost of chiropractic care, but some private insurance companies from overseas will. Ashley: What is the best way to find a trustworthy, reputable chiropractor in Japan, and one who speaks English if necessary? (Other than going to your clinic of course - for those who don't live in or close to Tokyo). Dr. Takeyachi: Contact the Japanese Association of Chiropractors (JAC), which is a WHO-affiliated WFC national member organization. JAC provides information of certified offices, with English speakers, near you. Please contact them over the phone or via email. You can also look at the certified office list on their website. Ashley: Is there anything else you believe expats living in Japan should know about chiropractors and chiropractic care here? Or health care in general? Dr. Takeyachi: In Japan many medical doctors don’t know what chiropractors do to help patients but chiropractic care itself has been widely accepted in the community for years, even though it’s not covered by the national health insurance. That's because people can get great results with chiropractic care. If you are searching for a drug-free, surgery-free, conservative treatment, chiropractic is a good potential option amongst complementary and alternative medicine in the health care system. However, be careful when you choose a chiropractor in Japan, as the government does not regulate chiropractic care. Accidents and problems as a result of chiropractic treatments are sometimes reported by chiropractic practitioners who don’t follow the strict code of ethics and self-regulation. If your chiropractor is a JAC member, you found the right one. If you are an expat considering seeing a chiropractor who offers consultation in English, please feel free to contact the JAC office or email me at my clinic.